Food made for me, by me and by others. Follow me @foodfrankly . Forever a food legend in this house along with “Helen’s Super-Tangy Fish Pie®” (and man, it was tangy) was the disastrous “Fish-Splat”. 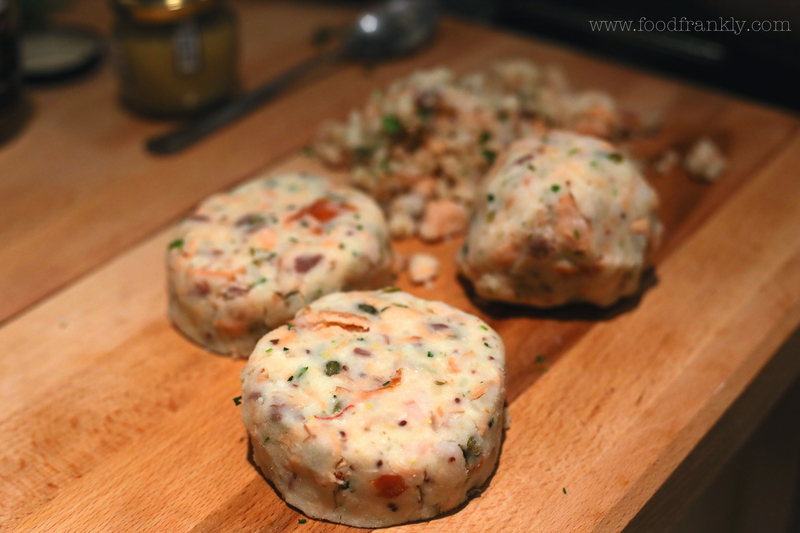 It was a hastily assembled and surprisingly liquid concoction supposedly resembling a fishcake. Things didn’t start well – as the cakes hit the pan, they immediately doubled in circumference. Things got worse as I tried to flip the gloop with a fish slice; the individual cakes became ‘one’ in a spectacular display of entropy. A mega-cake formed in the centre of the pan and the Fish-Splat was born. As I despondently scooped a quarter of Fish-Splat onto our plates, filling the air with profanities that would cause Tarantino to blush, something changed. Like that hangover from your first bottle of booze after raiding your mate’s Dad’s drinks cabinet at their 17th birthday party (french brandy…shudder…), I couldn’t face the prospect of going through it again. It’s a new year and a new me though – time to man-up and face the fear. Well, I pleased to say things turned out a little better this time. 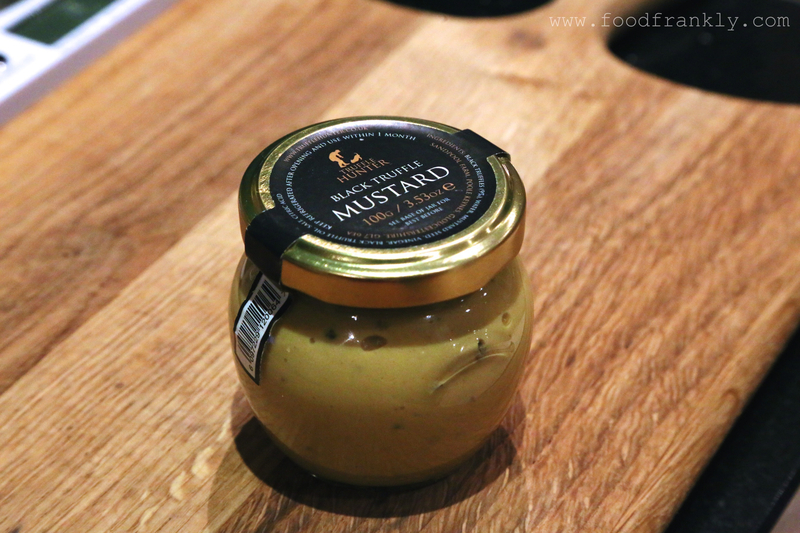 I took the liberty of using some of the mustard flavoured with pieces of truffle shown below. I’m normally a little skeptical of anything infused with truffle, but this was potent stuff and had to be used carefully. Any mustard is fine of course though, pick your weapon of choice. 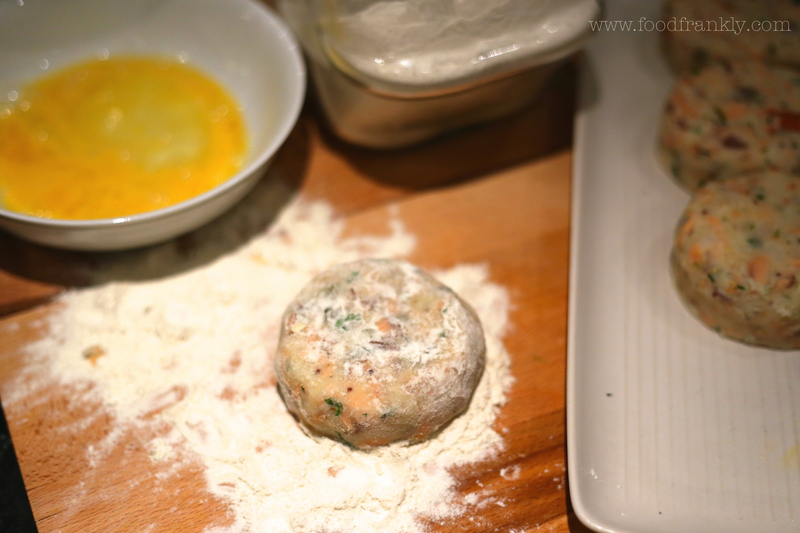 Joking aside, there is little secret to a good fishcake, jut ensure you let the mashed potato dry thoroughly and avoid introducing any extra liquid. A quick chill before adding the breadcrumbs and frying goes a good way to avoiding Fish-Splat too, unless you’re into that sort of thing. 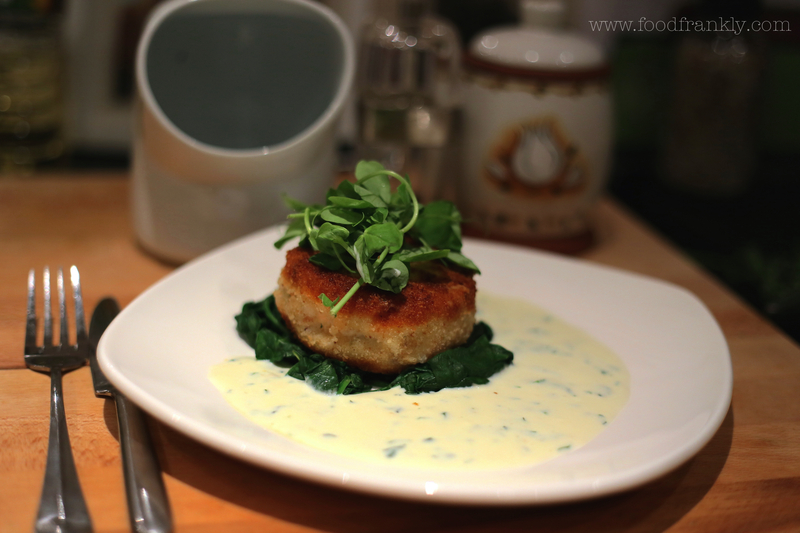 The tarragon cream sauce was basically a white sauce made with a little extra cream for richness. The tarragon was added once the heat was removed so as not to lose its delicate flavour. Finally, some steamed spinach – the perfect partner to counter all that richness – and peashoots for a little freshness and flourish. 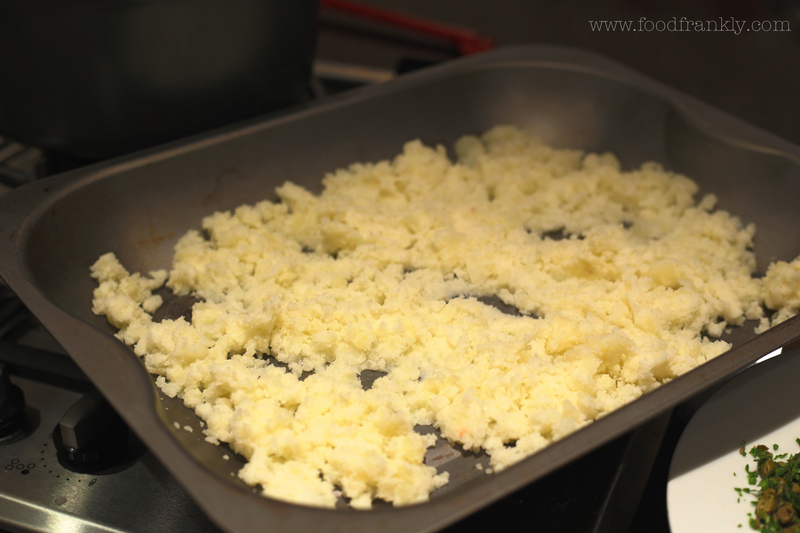 Cook the potato, mash and lay out thinly on a tray to steam dry until cool. 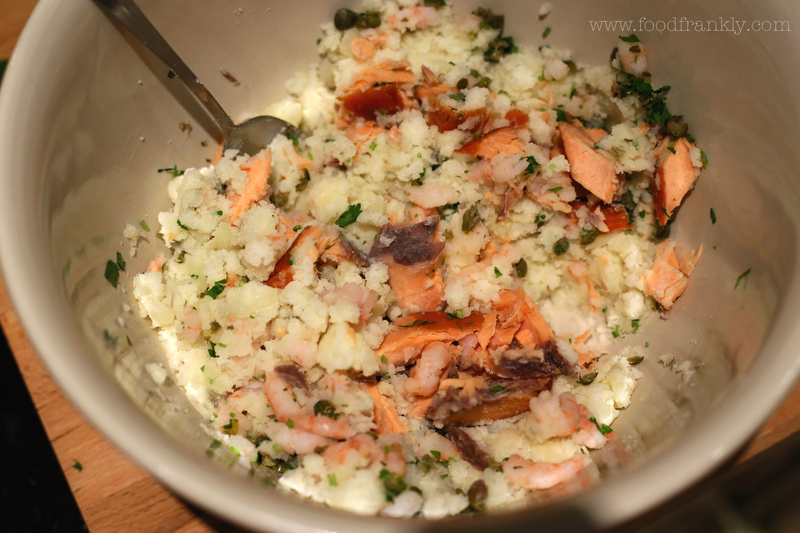 Chop the parsley and capers and mix into a bowl with the smoked salmon, cooked prawns and potato. Add the parmesan, truffle mustard and salt to taste. As all the ingredients are cooked, tasting the mixture is no problem. Make into cake shapes and chill for half an hour. Once chilled, coat them in flour, then egg and finally breadcrumbs. 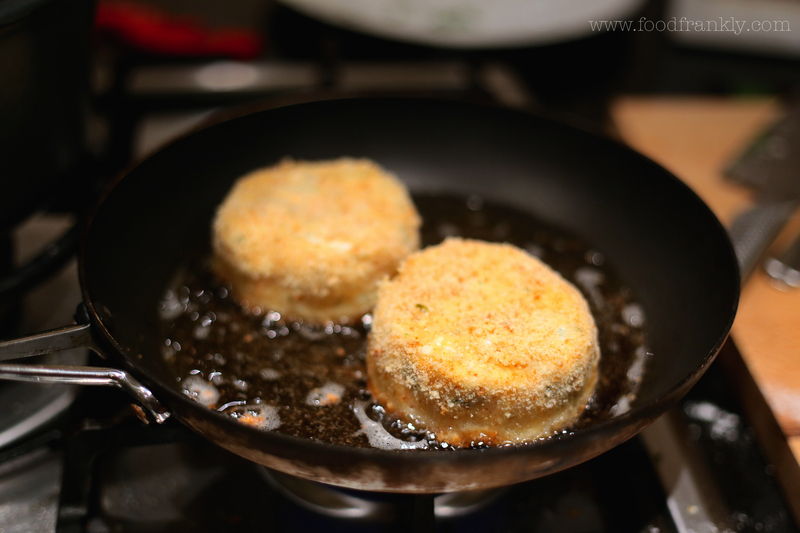 Fry on each side, until golden brown, in plenty of oil, keeping them well spaced in the pan. Marvel at their firmness – wipe the tear from your eye. Meanwhile, make a white sauce by blending the butter and flour. Fry it gently in a saucepan for a couple of minutes then gradually whisk in the whole milk. Once at a simmer add the cream and reduce until thickened a little, but still easily poured. Remove form the heat and stir in the tarragon. Season to taste. Serve it with steamed spinach, some peashoots and a nice Sauvignon Blanc.